Ok, so I have had a lot of requests for this recipe. I originally fell in love with the mac and cheese at Miss Mary Mac’s Tea Room in Atlanta. Seriously delicious, so this is my take on the recipe. I’ve been making it for at least ten years now so it’s changed a little, but the basics are all the same. I’ve never really written it down so please bare with me! I warn you all, there is nothing low fat or healthy about this one. Just pure unadulterated delicious cheesy custardy goodness that will put you in a carb coma! Boil your noodles in water with a dash of salt, about 10 minutes or so. Strain and let strain while you make your Rue. There is more of an art to a good Rue so this is the tricky part. Put 1/4 cup of flour into a sauce pan. Add about 1 cup of milk. Put your heat on medium high/high, stir really well so that the flour and milk form a paste of sorts. This is the part where you are cooking the flour, but you don’t want to burn it to the bottom of your pan. So add more milk if you need it. The consistency of your milk should become very thick, almost as thick as a good yogurt. At this point you want to add the remainder of your milk to the pan. Keeping the heat medium. The goal is now to get your milk at that similar consistency. Bring your milk to a low boil, keep stirring or it will go over the sides. Now turn the heat to low. You will do this boil, simmer process around three times. Can’t remember the exact cooking term for this, but it is an important step. Add dash or more of white pepper, a couple of drops of hot sauce, and a handful of shredded cheddar cheese. Now in a separate bowl, beat your eggs until they are light yellow in color. 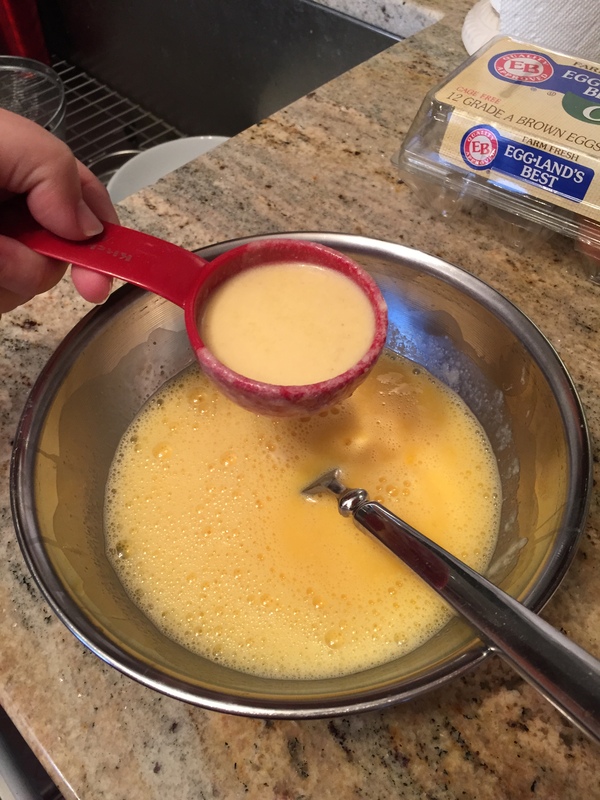 The next thing you will do is take a small measuring cup full of the milk mixture and beat it into the eggs. This is tempering the eggs, so that when you add it to the milk, you don’t have scrambled eggs. 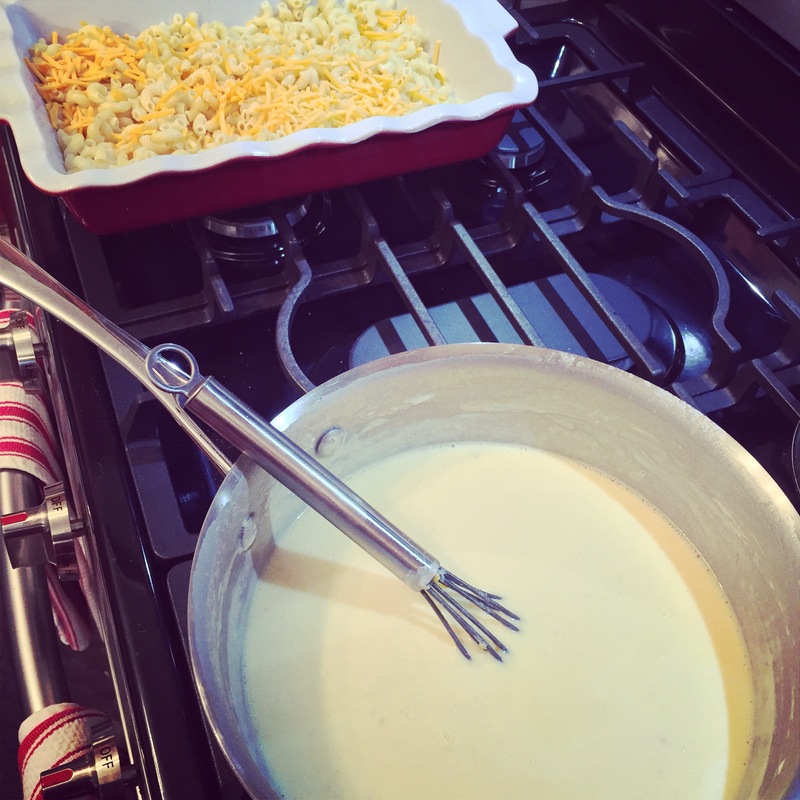 After then eggs are tempered (warm) then add the egg mixture to your milk mixture (with the pan off the heat). 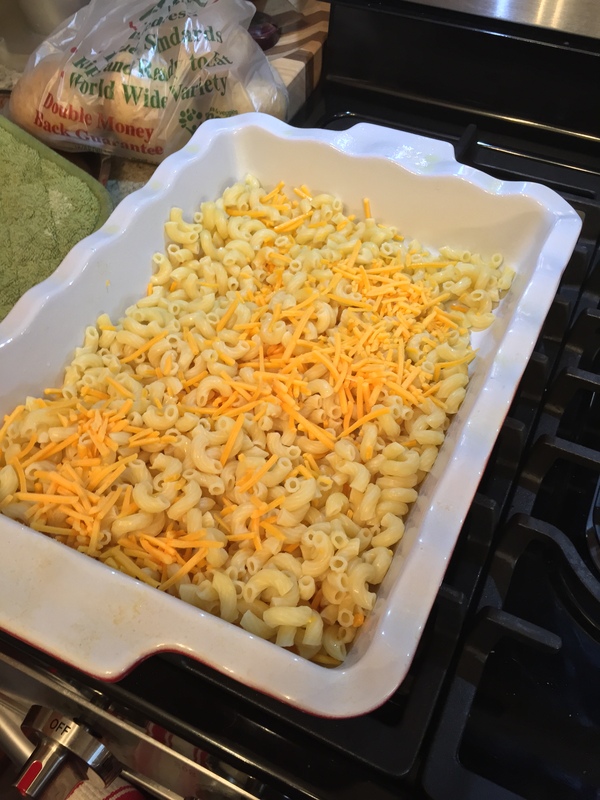 In a medium sized casserole dish, spray with non-stick spray and add a handful of shredded cheese. Top with your strained noodles and mix the cheese and noodles together. 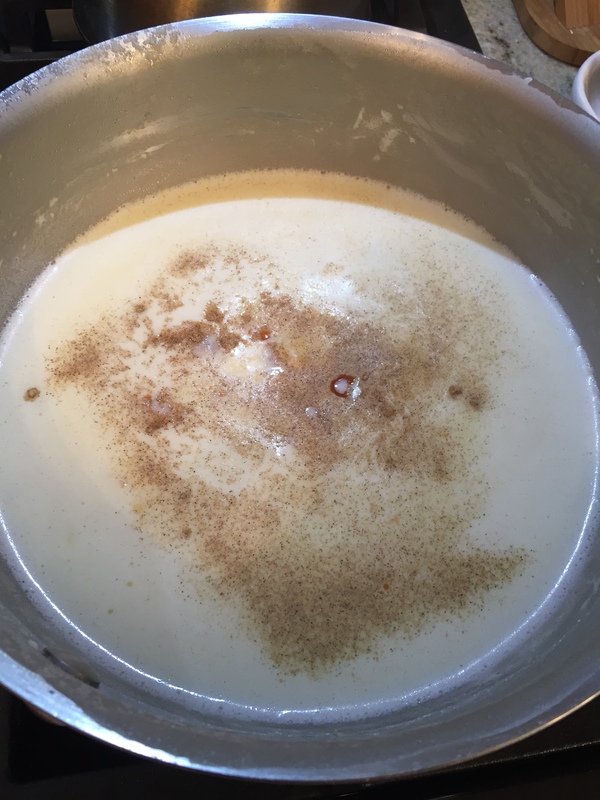 Now take your milk custard (by the way that is what your milk and egg mixture is now) and pour over your noodle and cheese mixture. I always mix up the noodles and custard to be sure that it’s evenly spread. Next top with all of your cheddar cheese. I typically will prepare the mac and cheese the day before I bake it. I am not really sure why, but the custard always seems to set faster/better when I do this. So wrap the casserole dish in tin foil and put in the fridge. Your welcome and don’t forget I warned you! Don’t expect to do much of anything after a good serving of this! Up next on my prep menu… aNut Davetta’s Sweet Potato Casserole!